Our six workhorses contribute immeasurably to our goal of strengthening the vitality of the farm. Their balance of tremendous power, sharpness of mind, and fluid grace is truly something to behold. From our perspective, the horses offer a multitude of benefits over tractor-powered farming. 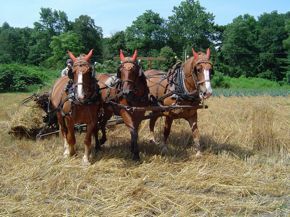 Our horses help us with nearly every task on the farm, from heavy plowing to delicate cultivating. 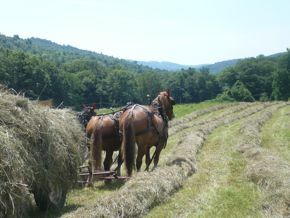 They can haul the harvest from the field, give hayrides, dig potatoes, and mow and harvest their own hay and grain. In the winter they can skid logs from the forest, and even plow snow. 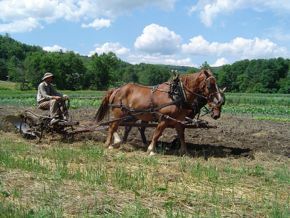 The horses are instrumental in enriching the soil, as they are the primary source of manure on the farm. In the fields, they tread lightly and do not cause the soil compaction that can result from the wheels and weight of a tractor. The horses are essentially solar-powered. They run on grass, hay and oats, which they help us grow and harvest right here on the farm. By using horses for our farm power we help to minimize our carbon footprint; they deliver living, clean, and sustainable energy. The nature of work done with the horses - sweet smells, gentle sounds, feet on the ground - lends itself to a heightened sensitivity to the subtle and dynamic qualities of the world around us. This attunement is essential to good farming. Sharing work and life with our equine partners is simultaneously grounding and uplifting.